This tab contains advanced settings for the source. As mentioned previously, each Webcampak has its own internal FTP server, you can use those credentials to connect directly to the source, to download or delete content, or to configure an other source to send pictures to this particular source. A password is generated automatically at source creation, you can change it at anytime. Those are the email configuration settings used to send emails from Webcampak. 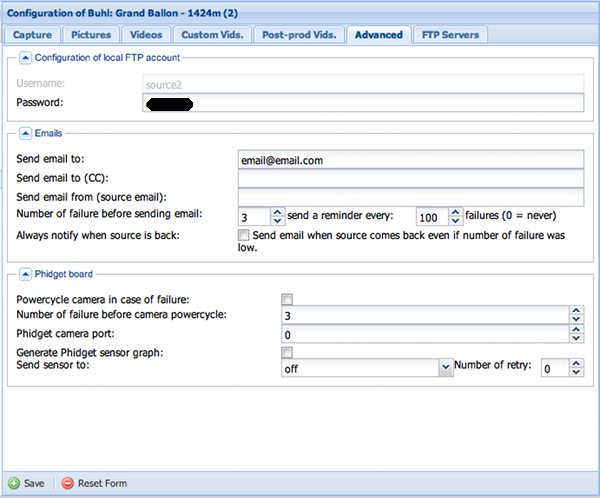 You can also specify when to send emails in case of capture failure and how often should Webcampak send you a reminder. Phidget board can be used to automatically restart the camera in case of capture issue (if for any reason the camera crashes). You can also create a daily graph containing sensor values and send this graph via FTP. This is an advanced situation and details are not yet available in this documentation.